Discussion in 'APEX Race Parts' started by APEXRaceParts, Dec 26, 2018. The new APEX SM-10 wheel for Mustangs combine a straight 10-spoke design with our “I-beam” milling technique to produce a lightweight wheel. The face profile provides unmatched big brake clearance while the new milling feature has increased strength while shedding weight, and it adds a visual feature typically only found on the most expensive race wheels available on the market today. 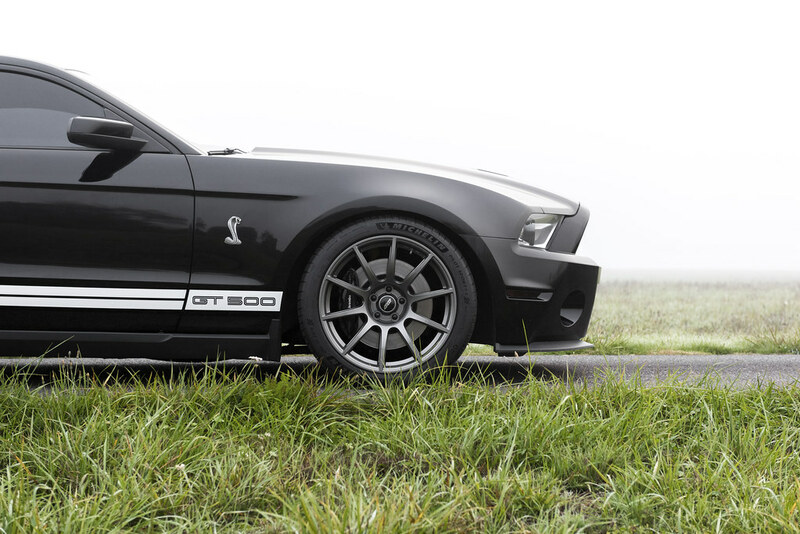 These concave SM-10 wheels are designed specifically for your Mustang. The SM-10 provides chassis optimized fitments and proper load distribution. If you’re looking for a cost-effective lightweight 19” wheel, this is your answer. All Mustang SM-10 wheels are built with a profile 2 - medium concavity face profile, as that yields optimum results with each of the wheel specifications. We’ve upgraded these wheels to include a knurled bead seat to reduce unwanted tire rotation. This added feature will help keep your balance stay truer throughout the life of the tire. Unlike the narrow lug recesses of most other wheels, the SM-10 wheel features a wide open hub center that easily accommodates oversized race lugs and beefy impact sockets. This allows for quick and easy wheel changes and prevents chips and scratches from tools. We don't reuse one cap design for all of our wheels. Every SM-10 wheel is designed to work with factory center caps. You can easily replace APEX center caps with OEM S550 Mustang caps for a clean factory look. The SM-10 wheels will ship with our Gloss Black center cap that mimics the size and shape of a Mustang factory center cap. All APEX wheels are purpose-built for select vehicle applications, and centering rings are never required for any Mustang application. All 5x114.3mm bolt pattern wheels feature a direct-fit, 70.5mm center bore. Spoke clearance is only half the problem. The barrel construction on a wheel also needs to be big enough to clear the sides of your caliper and rotor. Many aftermarket wheels that have aesthetic compromises in their design may work with smaller stock brakes, or smaller diameter big brake kits, but the larger kits will pose a major problem. 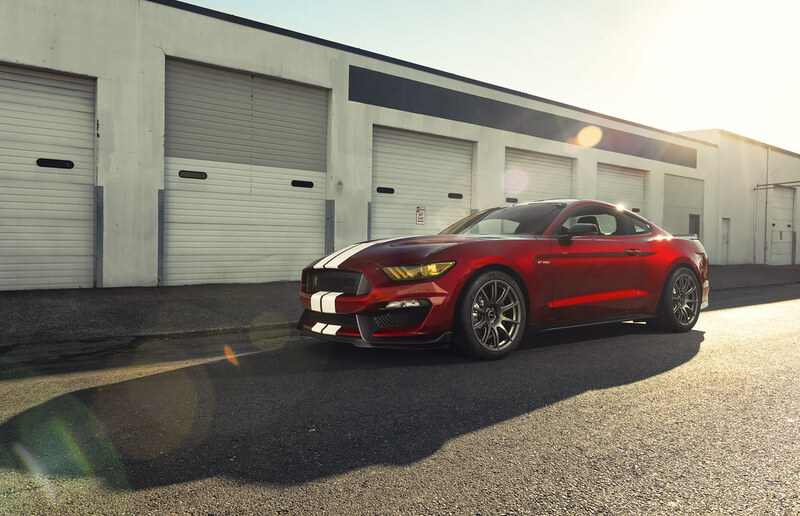 Targeted at the serious performance-minded owner, 19” SM-10 wheels clear up to 15.5” diameter rotors and 6 piston calipers found on the GT350. The SM-10 Mustang wheel can be used with all OEM and aftermarket mounting hardware with a ball seat lug recess. Lug bolts, wheel locks, and stud conversion kits all work perfectly. The SM-10 wheel also accepts wheel spacers without issue. The shallow rear chamfer allows the wheel to remain hub centric even when 5mm flat spacers are used. The chamfer is deep enough to clear the chamfered lip found on some aftermarket spacers that would typically cause improper seating of the wheel and, therefore, wheel vibration. TPMS sensors, which monitor tire pressure, are one piece of technology that can't be compromised. All APEX wheels accept OEM and aftermarket equivalent Ford/HUF TPMS sensors, and any standard sized metal or rubber valve stem. Use the chart below to help select the correct TPMS for your vehicle. Flow-forming allows for a significant reduction in rotational mass by reducing barrel weight. This manufacturing technique allows our wheels to be almost as light as a traditional forged wheel, but without the significant increase in price. Track duty requires a wheel that can handle the punishment of high lateral G’s, hitting berms, and every once in a while, a small off-track excursion. Spoke and barrel design are a major factor in wheel strength. The flow-forming technique uses high-pressure disks/rollers to roll the wheel’s barrel into its final shape. This gives the barrel the same strength properties as a forged wheel since monoblock wheels go through a similar step to form their barrels. We design our spoke dimensions to help evenly distribute loads from the barrel to the center of the wheel. The lack of a front lip, and spokes directly connecting to the edge of the wheel, also add increased strength to the outer lip of the wheel. Stretched rubber, narrow tires, and fender rubbing are not elements to look for in a competitive wheel/tire setup. 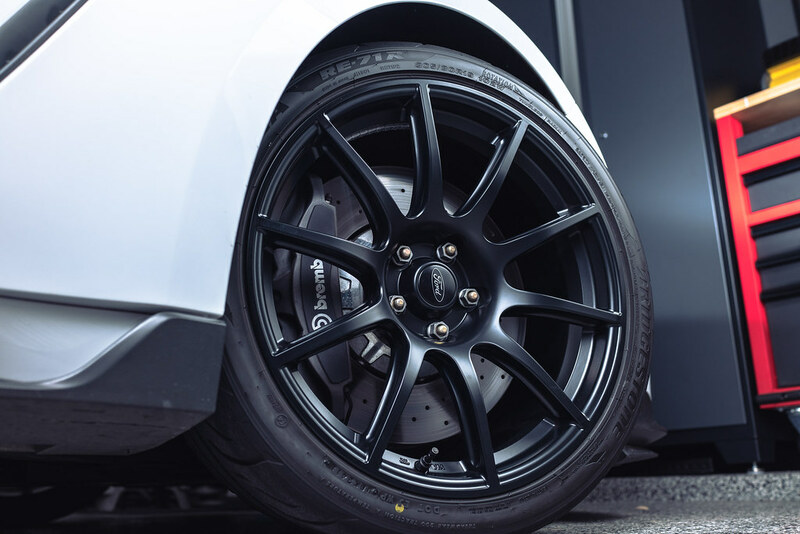 All of our wheels were designed with offsets that allow for proper fitment of extreme summer, and r-compound tires without the need for spacers or fender rolling. This means keeping the tire under the fender, and away from suspension components. Track oriented wheel widths are also important as they provide proper sidewall support under hard cornering. Too much rubber for a wheel results in excessive sidewall deflection, which translates into sloppy and delayed turning response. Computer simulated stress tests are no match for real-world testing when designing a lightweight wheel that will see extreme loads. All APEX wheels are crush and load tested to exceed JWL standards and those results are independently tested and certified in Japan by the 3rd party government agency known as the VIA. Countless wheel companies falsely claim they are tested and certified by the VIA, and so they lack the certificates to prove it. We test and certify each and every design, diameter, width, and offset, separately. We didn’t just redrill and recycle our BMW 5x120 SM-10 design, we’ve rebirthed it. 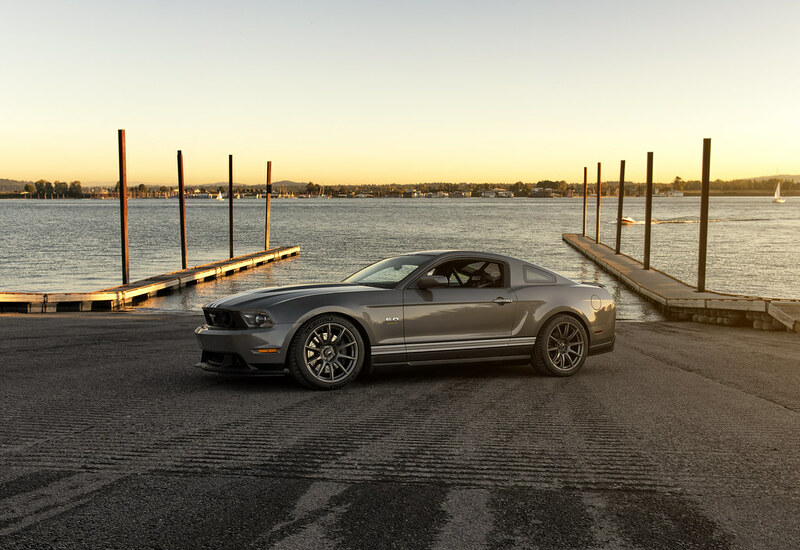 After seven months of Mustang-specific optimizations, we’ve minimized weight while maximizing strength. Strength tested to surpass the 5x114.3 JWL/VIA’s standard, and enthusiast tested to beat their weight standard. Since most Porsches have an inherent rear weight bias and run wide rear wheels, we’ve strengthened the inner lips. The result is a lightweight wheel with extra strength in all the right places. Use the SM-10 with confidence on both street and track. Questions about tires, fenders, brakes, spacers, or suspension clearances? Click here to review our helpful chassis-specific fitment guides. Popular street and track tires are now available when you order APEX wheels. 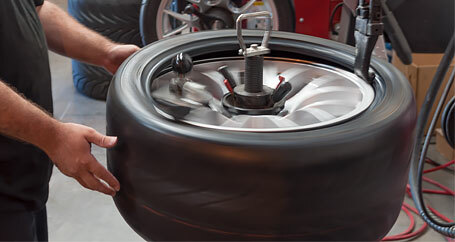 Add tires with your wheel order and get free tire mounting and balancing by our trusted enthusiast technicians. We use high-end, touchless equipment and inspect every wheel and tire combo thoroughly before they leave our warehouse. With our competitive tire pricing bundled with the savings of free mounting and balancing and convenience, it’s the ultimate wheel & tire package. *Note: Tires will only ship mounted to the wheels in your order, and can not be sold separately. Tires and wheels must be purchased in the same transaction. Tire-only orders will be canceled and refunded. Shipping: All orders are shipped directly from us via UPS. Bill Pemberton, TymeSlayer and VoodooBoss like this. Many have asked us about the great features and details of the SM-10 wheel design, and while images are helpful, they simply do not do the wheel justice. We took things a step further by creating the following video. Please give us a bit more information , this thread is so bare of real data -----------NOT!! Geez, Cory, I may be an Apex fan , but a lot of it has to do with the extreme dedication you guys have to our fairly small group. I know I have mentioned to my show car buddies that they need to check out your rims, but making a wheel for TrackusRaticus folks is a niche market and I hope everyone on TMO realizes how few companies really look at the issues a track wheel may experience differently than one just for cruising. Thanks again , and I will try not to be such a FanBoy, but I for one appreciate all the hard work, dedication , activity on our Forum. The service after , during and before the sale is phenomenal - best of luck with the new wheel. lil’Zeus and Red5OH like this. Since Sweet Lorraine is already sporting a nice set of 19x10 EC-7s - she'd like a different looking set like these SM-10s in matte black. Please give us a bit more information , this thread is so bare of real data -----------NOT!! Geez, Cory, I may be an Apex fan , but a lot of it has to do with the extreme dedication you guys have to our fairly small group. I know I have mentioned to my show car buddies that they need to check out your rims, but making a wheel for TrackusRaticus folks is a niche market and I hope everyone on TMO realizes how few companies really look at the issues a track wheel may view differently than one just for cruising. Thanks again , and I will try not to be such a FanBoy, but I for one appreciate all the hard work, dedication , activity on our Forum and service after , during and before the sale. Best of luck with the new wheel. Ha, you had me going there at first Thanks for the kind words, Bill. I agree, we would love to produce them in 18" sizes and could if the demand picks up for it. Be on the lookout within the next few months. We are getting a fresh stocking order of these babies in just a couple of weeks too! As promised, the SM-10 is finally back in stock in our most popular sizes after a long hiatus. All are here in pretty much the full complement of finishes, ready to go out. Get your orders in now before they're gone! 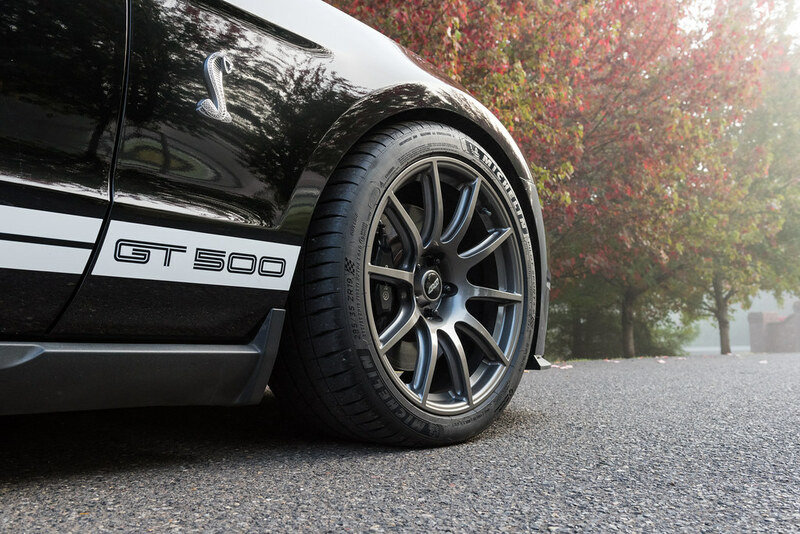 David's GT500 is sporting our 19x10" ET40 squared set with 285/35-19 Michelin Pilot Sport 4S at all four corners which provide this big powered car with equally big grip. I love mine so far! APEXRaceParts and Bill Pemberton like this. Love my SM-10s. Can't wait to get 'em on my Boss. Pictures to come... I promise. APEXRaceParts, Bill Pemberton and ArizonaBOSS like this. @TymeSlayer there is a guy out here that has a KB Boss with Anthracite SM-10s and they look GREAT. I've thought about Anthracite but all my wheels are satin black and give the KB Boss a more menacing look. This included my Apex EC-7s and my new SM-10s. BTW, spent the past weekend down in the Scottsdale area (Spring Break with the family) and the weather seemed perfect for tracking (Mid-80s). I can't imagine running down there in the summer. cholmes1, TymeSlayer and The_Dead_Cow like this. Love my 19x11 SM10's. Got the RE71R mounted on them but I'm using up the rubber on my EC7s and then I'll post some pictures of them on my '12 Boss. 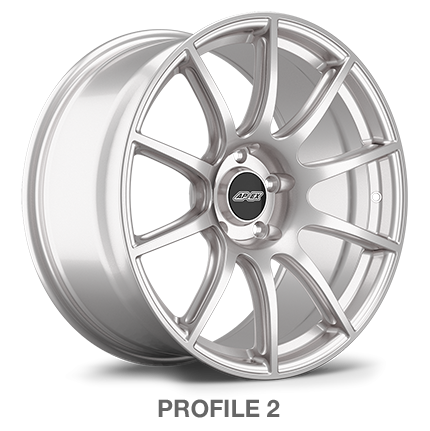 Yes I would be interested in 18x10 or 11 in race silver too. Mad that I missed the group sale on the EC7's earlier this year. Any chance for 18's this year?